Regardless of Your Background or Experience! Take the song "Hotel California" from the Eagles as an example. Remember it? "Livin’ it up at the Hotel California…"
That's the power of residual income, a.k.a. recurring, or passive income - they're just different words to describe the effortless process of receiving ongoing payments for new product or service offers your "members" ask for. My name is Andrew Lock, I’m the presenter of the popular WebTV show, "Help My Business!" (www.HelpMyBusiness.com) and author of 5 best-selling business books. You're tired of working long hours, only to be paid LESS than you're worth. You believe that you deserve a better quality of life, and you'd LOVE to spend more time with your family and take regular vacations without worrying about how to pay the bills while you're traveling. You want to have complete control of you and your family's financial future. You're trying to rebuild your retirement fund that's been decimated by the recent economic turmoil. You've tried various ways to make money ... but none of them have worked. Unfortunately, the old adage "the harder you work, the more you’ll earn" is a lie! I work less now than I’ve ever worked in my life, and I LOVE what I do more than anything else I’ve ever done! It's frustrating, because you can never get ahead. Interestingly, when most people think about making money online, they imagine its hard work and difficult. And there’s always a 'must have' tool or course that promises to be a "one-click" wonder. You've probably been burned enough times to know that isn't true! The truth is, there is some work involved up front, but it's a system, it's enjoyable, and you’ll feel great about what you're accomplishing. Look, it's not your fault if you’ve only just discovered residual income. I’m a pioneer of membership sites, I’ve tested many different membership concepts, and I’ve blazed a trail so that you don't have to. We're now at a point where anyone (yes including you), regardless of your background or experience, can create a profitable membership website. Join me to do just that, and follow my step-by-step system. If you know in your heart that you should be making more money, I'm delighted you're now discovering the first PROVEN and GUARANTEED system to create a membership site in a topic of your choice! I've used the term 'membership site' several times now, and those two words are the magical key to unlocking your fortune, so I want to be clear about what a membership site is. to access (a) quality information and (b) a community, on a niche topic of interest." The primary goal of your membership site is to attract new members, and then keep them happy! Your members pay you a monthly fee of say $27, $37, $97 or even $997 per month (depending on your market). Netflix is a popular service for people who want to watch movies online. People who seek their soul mate can use eHarmony to help them. Investors who want to learn and compare notes with other investors use MotleyFool. eDiets is designed to help people who want to lose weight. Obviously, these are some heavyweight industry-leading websites that are generating millions of dollars a month! Netflix alone is generating a whopping $312,000,000.00 (MILLION) each month, and rising! It's unlikely that you'll create the next Netflix, of course. But 'behind the scenes' there are countless individuals who are making at least a thousand dollars a month or more (usually a LOT MORE), with 'micro-niche', special-interest membership sites. FlowerArranging101.tv attracts people who want to learn flower arranging. RestaurantOwner.com provides resources for independent restaurateurs. UniversityOfMakeUp.com is a hub for people who are interested in learning advanced makeup techniques. JazzPianoLessons.com offers ongoing tutorials and support for people who want to learn how to play jazz style piano. BouncyCastleOwner.com is a members community for, you guessed it, bouncy castle owners! As you can see, there are all sorts of diverse, and some might say 'obscure' niche membership sites. Each one of their owners are making monthly residual (and rising) profits, with a website that's both fun and profitable! How can YOU create residual income with a membership site? "Membership Site Success System" is 100% video based training, which you take at your own pace. There are 12 modules, each with 3 or 4 sections, and you’ll learn everything from choosing a niche, through to advanced member retention strategies. It's risk-free, and 100% guaranteed. site in any niche, with paying members, 100% guaranteed! Dependable recurring income, that doesn’t stop! Why are membership sites so appealing to members? Two words: Content and Community. They receive content in the form of articles, news, views, and high quality, helpful information. The community aspect automatically comes from other members, via forums, discussions, and comments within your site. As you know, it's basic human nature to want to 'belong' to a group of like-minded people, and membership sites directly fulfill that need. If you're into wildlife photography, with my system you can easily create a membership site for others who feel the same way, and charge them a monthly fee to access your content and community. If you’re a dog kennel owner, you could create a membership site community of other dog kennel owners and share ideas and strategies for running a successful dog kennel. If you suffer from a condition like diabetes, you could provide help and support for others with a membership community around that topic. Do you see the exciting, endless possibilities? And if you’re unsure about which niche to choose, relax because I'll personally help you to choose something that you'll really enjoy. The Internet is the single most powerful business tool the world has ever seen ... AND when you invest in The Membership Site Success System, you'll be given the skills to making consistent, ongoing residual income using the Internet! The fact that you're on this website probably means you have a computer that's connected to the Internet. It's also probably safe to say that you've bought something online. And of course you're not alone. Consider this startling fact: The Internet has already grown faster than the telephone, radio, TV, and the mobile phone, in fact it's the fastest growing innovation in history! MILLIONS of dollars are spent every minute at popular online stores like Amazon.com, Ebay.com, Groupon.com and others. You can see that the Internet is NOT a fad... and to put it bluntly: The longer you ignore it, the farther you'll get left behind. Once you learn the 'insider secrets' I'll reveal to you in the training, with a few clicks of your mouse you'll be continually generating money over and over again, month after month. Just imagine the thrill of watching new members signing up each day, as if by magic, from work you did just once to setup the site. There are very few things in life that match the excitement of hearing the 'ka-ching' sound of money being sent to your bank account while you put your feet up and enjoy doing something you love! Frankly, the Internet is experiencing a gold rush of explosive growth. It's already created more millionaires than any other business model in recorded history. 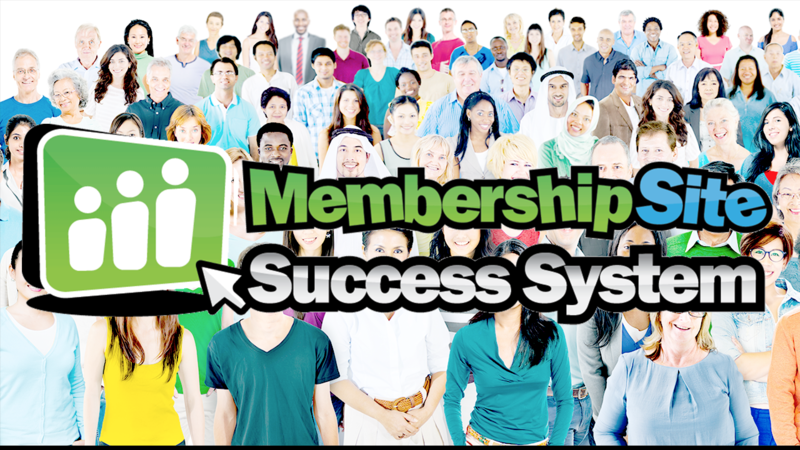 "The Easiest Way to Build Your Membership Site and Make Money"
The Membership Site Success System will mark the beginning of an entirely new, liberated, prosperous, and truly remarkable life. All of the training is via online video. You can start, stop, and pause them whenever you want to. It's literally like looking over my shoulder as I guide you through the process, and you'll simply follow my steps. I truly believe I've made it as easy as possible for you to quickly and easily create a money-making membership site. Are you happy with how much money you have in the bank right now? Do you believe you're talents are being used to your full potential? Have other "business opportunities" resulted in true financial freedom for you? Can you afford to go on 'testing' lots of different money making methods? Let's get real. If you decline this invitation, what else will you do to change your current financial situation, get out of debt, and achieve the financial freedom you deserve? 1. You have an open mind and a positive attitude. 2. You are extremely busy and need a FAST way to learn and grow residual income. 3. You are highly motivated to create your own membership site business to create your financial freedom. 4. You understand the power of recurring revenue, and you're ready and willing to trigger it in your own life. 5. You are ready for your business to support a much better lifestyle for you and your family. 6. You are inundated or even overwhelmed with information and deep down you know you need a 'paint by numbers' system to follow. "I am from Germany. When I started, my Internet marketing skills were at a bare minimum. As I followed Andrew's techniques, I started to see the light at the end of the tunnel. Everything I've learned from Andrew is a fast-track to success. My site is now launched, and in the first 4 days I got 2000 people into my system!" "Andrew’s stuff is GREAT. I highly recommend it. It’s already paid for itself and has already made me money." "Andrew has been a great support. He is prompt with his responses whenever I have a question and is a reassuring and encouraging presence as I am growing my business. He also asks the right questions to challenge me to progress further along my path to success. I have now launched my membership site with Andrew's help!" "Andrews membership program is awesome. I have learned a lot, which gave me the confidence I needed. Andrew provides outstanding support. Whenever I needed to know something, I got a quick and helpful answer. That helped me to stay on track and to keep going, even when I had doubts or worries about it. I've now launched my site successfully!" As you probably know, a college or university course typically costs tens of thousands, often much much more. Some students leave with nothing more than a piece of paper and a huge debt to pay off. Certainly, there’s no guarantee of income, let alone recurring income every month! This transformational course is the culmination of countless years of research, testing, and experience. Frankly, to hire me personally for a consultation would cost you at least $10,000.00 a day – and even then you’d be on a waiting list because I only offer a handful of consulting days each year. Initially I contemplated a fee of $5,000.00. I felt that was fair, since I can guarantee a return of at least $1,000.00 per month for anyone who follows my system explicitly. Many franchises cost more than $100,000.00 with ZERO guarantees that you’ll EVER make a profit! For a limited time, you can access everything including one on one support with me, without limit, for a one-time investment of $1990. In life and in business there are no guarantees, but the Membership Site Success System is different in every way. I believe in a strong guarantee, to remove all risk for you. 1. The training will be presented without 'geek-speak,' in plain English that you can understand. 2. You'll be shown everything you need to create a membership site on a topic of your choice. 3. Using my one-on-one support whenever you need it, you will have all your questions answered. If you do your part as outlined above, I guarantee to do mine. If I fail to help you as described here, let me know and I will happily refund you in full for failing you! That means ALL the risk is on me! Literally hundreds of people will be reading this web page around the same time as you. I have to impose a cap of 30 students at a time, because of the one-on-one support I provide. If you delay, you may not be able to get in, and you’ll be placed on a waiting list for when spots open up in the future. Look, you could easily waste years of your precious time, and tens of thousands of dollars chasing other opportunities that are unproven and not guaranteed. Why continue to bash your head against a brick wall day-after-day to try and find your own path to success, when there's a faster and cheaper option right here, that’s guaranteed? Plug yourself into my system. It's TESTED. It's PROVEN, and IT WORKS! Go ahead and REGISTER NOW using the button at the top right hand side of this page. I’m excited to witness your financial breakthrough! P.S. - The Membership Site Success System isn't just about making money, it's about creating long-term financial freedom for you, your family and your loved ones. Frankly, since I’m taking the risk with my guarantee, there should now be nothing holding you back from saying "YES" to registering for the course, because your fee is FULLY protected. Take back control of your life. Have confidence in yourself, and send a strong signal to all those people who doubted you over the years! Now is your time! Here’s to your success with membership sites! Now scroll up and invest in this course, risk free. Everything you need to create a profitable niche membership site, guaranteed. Get started now!